Before proceeing further, let us make one thing clear that this mechanism only adds a kind of extra security during wire transmission of data(most probably) but does not provide full proof security. If you're not using SSL, the attacker can just perform a man-in-the-middle attack and steal the data by giving the user a different key. 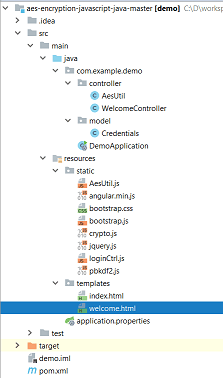 We have a spring boot and angular Js web app setup.Following is the structure. The method logMeIn() will be called after the click of submit button. 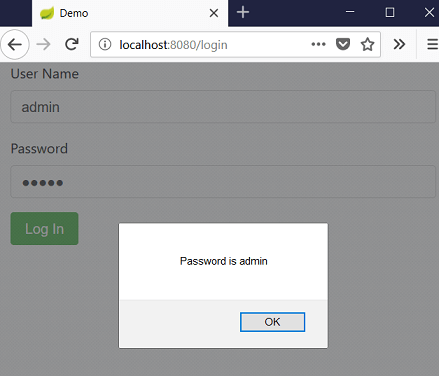 This method will use the common code defined in AesUtil.js to encrypt the password and make POST request to validate the password.The password sent will be in the form iv::salt::ciphertext In the server side, java will decrypt the password and send the decrypted password in the response which will be shown in the alert box. First let us implement the controller class that will intercept the login request. Here we have hardcoded the key.This key will be uniquely generated by the server and sent to client for each login request. The client will be using the same key while encryption and server will use the same key for decryption.Make sure the key length is 16 because we are using 128 bit encryption. Remember the format of encrypted text that we are sending from the client side - iv::salt::ciphertext. The text is decrypted in the same format. We already have IV, salt and cipher text. Following is the java util class for AES encryption and decryption.You can follow AES encryption and decryption in java for more detailed explanation regarding following implementation. Run DemoApplication.java as a java application and hit http://localhost:8080. Once the login page appears you can enter the username and password and click submit button and you can see the decrypted password in the alert.